Update: At 3:40 p.m. Fox Carolina reported that a break has been detected in the earthen basin wall surrounding the cooling pond at the H.F. Lee Plant in Goldsboro. A statement from the utility on Wednesday said there is a 50- to 60-foot break in a corner of the cooling pond, which covers 545 acres. Water is entering the cooling pond from the Neuse River through a spillway, and water is leaving the cooling pond though the opening in the wall. The cooling pond is a man-made reservoir that was constructed to supply cooling water to the power plant. Duke Energy said that based on the current state of the Neuse River and detailed studies of the area, it expects minimal impact to the river level from water leaving the cooling pond. The Neuse River has flooded three inactive coal ash basins at Duke Energy’s H.F. Lee plant near Goldsboro. However, the extent of the damage and any contamination will be unknown until the waters recede. Mike Rusher, spokesman for the NC Department of Environmental Quality, said an active ash pond at Lee was recently reinforced under requirements in the Coal Ash Management Act. That pond was unaffected, Rusher said. DEQ officials are at the coal ash facilities. In a Facebook Live video , he showed viewers the flooded area near the plant. The flooding from Hurricane Matthew is worse than that of Hurricane Floyd in 1999. During that storm, there was not a coal ash release from the dams, although a portion of them failed, Starr said. The active ash pond and the polishing pond received intermediate risk classifications. After the passage of House Bill 630, the Lee basins were classified as intermediate risk, which requires them to be excavated by 2024. Lower Neuse Riverkeeper Travis Graves saw flooded hog waste lagoons as he toured the area by boat and by air. The runoff from those lagoons will pollute the river with nitrogen and phosphorus, which can lead to fish kills. “Now we’re thinking of the bacterial contamination from the waste,” Graves said. The NC Pork Council posted an update today that said no hog lagoons breaches have been reported. Riverkeepers can’t complete their environmental assessments until the waters recede. Near Kinston, the Neuse River isn’t expected to crest until Friday, at 28 feet, breaking the previous record of 27 feet, 7 inches, according to NOAA. Flood stage is 14 feet. Upstream near Goldsboro, water levels are expected to recede over the next week, but still remain above flood stage. 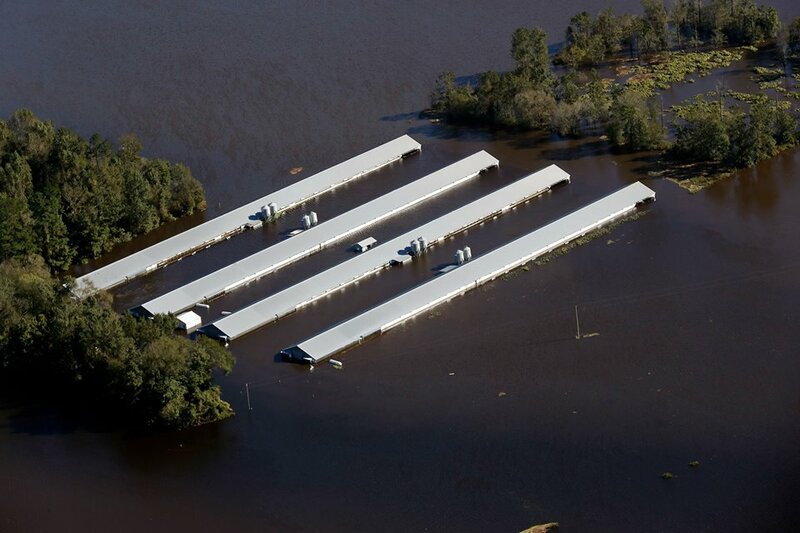 In addition to the hog waste lagoons, industrial poultry farms have also been flooded. One million gallons of human waste has also spilled into Jack’s Creek in Washington.